In one day, the Simms family of three more than doubled in size. In a room at the Fort McMurray hospital, Annie and Darrell Simms sat down for what they thought would be a routine ultrasound. But they were floored by what they saw on the monitor during the appointment back in June. The Simms family of three — Annie, Darrell and their three-year-old daughter, Payton — was about to get a lot bigger. "It was shock and awe," Annie said. "We were so excited to be pregnant and then to have four babies. "I just remember laughing and crying at the same time with all the emotion that was happening." 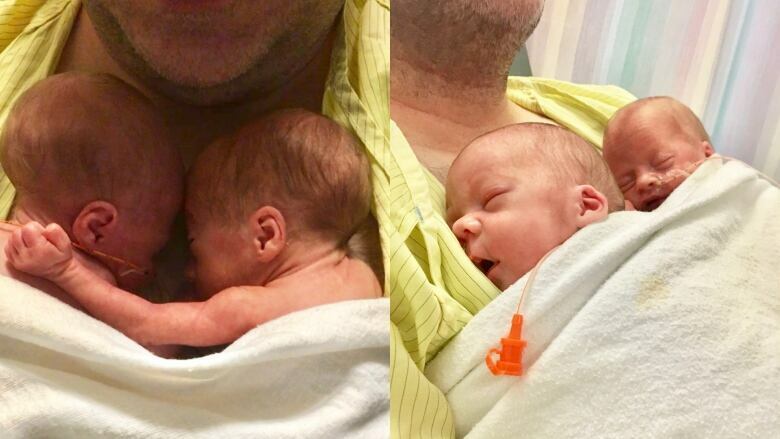 Four months later, Annie gave birth to four babies at the Foothills Medical Centre in Calgary, one of the province's only hospitals equipped to deal with complicated multiple births. The babies were due in January, but the two girls, Heidi and Julia, and two boys, Carter and Nathan, arrived at 10:52 p.m. on Oct. 30. The tiny deliveries ranged in weight from 2.1 to 3.4 pounds. "Each one of them fits in my hand," Darrell said. "We are very blessed and very lucky." The newborns remain under the watchful eyes of medical professionals, cradled inside cozy incubators at a neonatal intensive care unit in Calgary. Darrell and Annie also have a three-year-old daughter, Payton. (Mike Symington/CBC)Conceiving the quads wasn't easy. Annie and Darrel got pregnant with their first child, Payton, though in vitro fertilization in 2015. But when they tried using IVF to get pregnant with a second child, they didn't have any luck. The couple eventually turned to intrauterine insemination, an artificial fertilization inside the uterus. Needless to say, it worked. 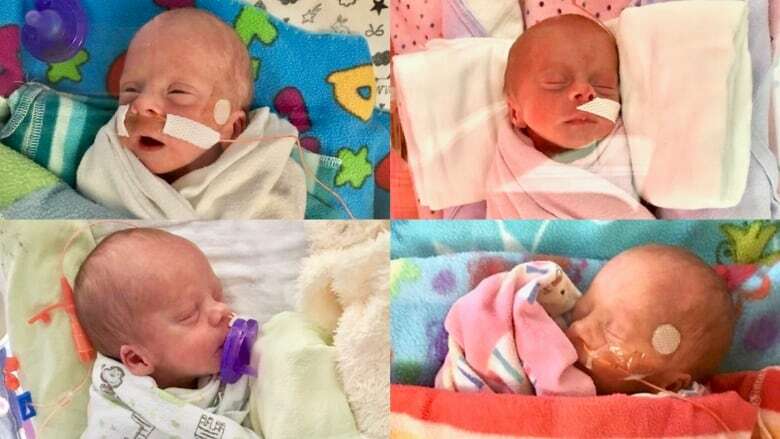 The Simms quadruplets are likely Fort McMurray's first, as the local hospital doesn't have any record of quads being born there, Alberta Health Services spokesperson Logan Clow said in an email. 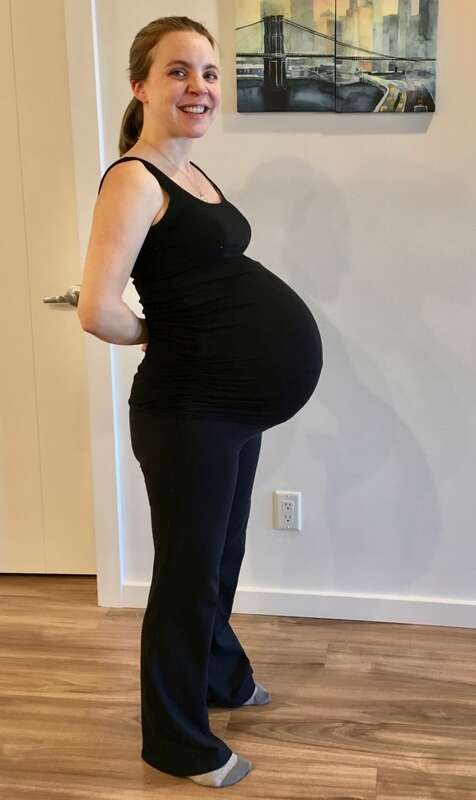 Annie Simms at 29 weeks pregnant. 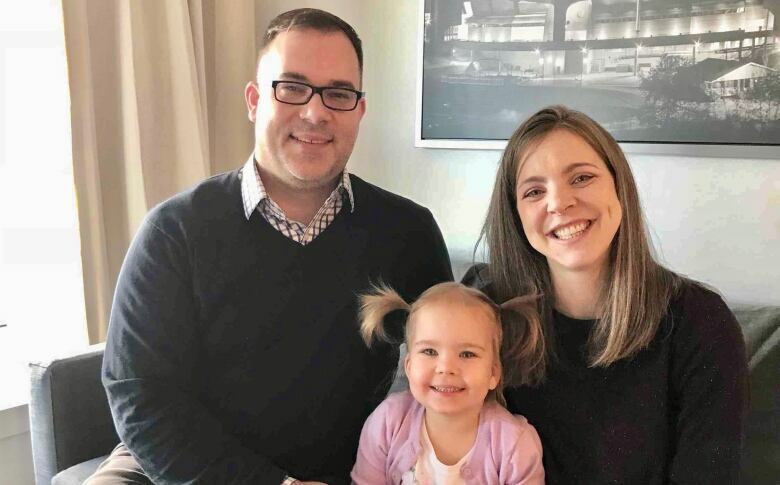 (Simms family)The Simms have temporarily moved to Calgary, but are hoping to return to their three-bedroom home in about three weeks. Annie, who comes from a family of 13 kids, said she isn't daunted by the new challenge, which is being documented on Facebook. "[Coming from a big family] has taken a lot of the fear away from it," she said. "We always had such a good time with each other. There's always someone to go to and get help with something. "And now my kids are going to have that." The family said they're grateful for the support they've gotten from the medical team in Calgary, their employers and community members who have donated baby supplies. They hope Heidi, Julia, Carter and Nathan will be a positive light in Fort McMurray. "It's a good news story for the community," Darrell said. "We've had some tough times in Fort McMurray."